Scores of independent US music stores have written an open letter to Jay-Z and Kanye West over exclusive release deals for their upcoming album. 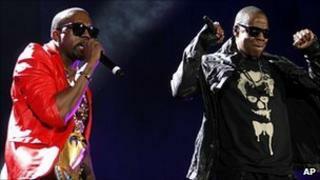 Watch The Throne will be released first on iTunes before the Best Buy chain's exclusive deal to sell the album nearly two weeks ahead of other music retailers. The letter says the deal will do "great damage" to more than 1,700 record stores and calls for equal access. Jay-Z's spokesman had no comment. Posted by the organisers of Record Store Day, the letter has been signed by shops across the US and calls the release plan a "short-sighted strategy". "We know that you are busy, and that you put most of your energies into creating great music, but we are writing to you in the hope that you will hear us and take the time to rectify this matter," the letter states. "As representatives of the independent record store music community, we are asking you to allow record stores and music fans equal access to your new album." Some of the letter's signatories have also threatened to pull current and previous releases by the two artists from their shelves. Others in the music retail industry have also criticised the move. According to Billboard, between the two exclusive iTunes and Best Buy release windows, 75% of the demand for the album is expected to be satisfied within 10 days. Exclusive release deals are now common for top acts. Recent examples include AC/DC's Black Ice given to Wal-Mart, while Guns N' Roses' Chinese Democracy and the Rolling Stones Biggest Bang DVD package, were also sold through Best Buy. Record Store Day was created in 2007 to celebrate independently owned record stores in response to counter media coverage about the demise of record shops. However, independent stores have suffered a decline over the last decade due to digital music sales. Could the indie record store be on the comeback trail?